The executive vice chairman of the Nigerian Communications Commission (NCC), Prof. Umar Danbatta, disclosed on Tuesday that the preferred bidder of 9mobile acquisition, Teleology Holdings Limited, has to pay the balance of $450million within the next 90 days to fully acquire the telecom company. This is the first time the commission has publicly confirmed the payment by Teleology Holdings. It is coming days after the NCC and CBN denied knowledge of any payment by Teleology at a hearing by the House of Representatives. Led by Adrian Wood (Former CEO of MTN Nigeria), Teleology Holdings Limited emerged as the preferred bidderin the sale of 9Mobile, ahead of about 16 companies that tendered expressions of interest (Eols) in February. 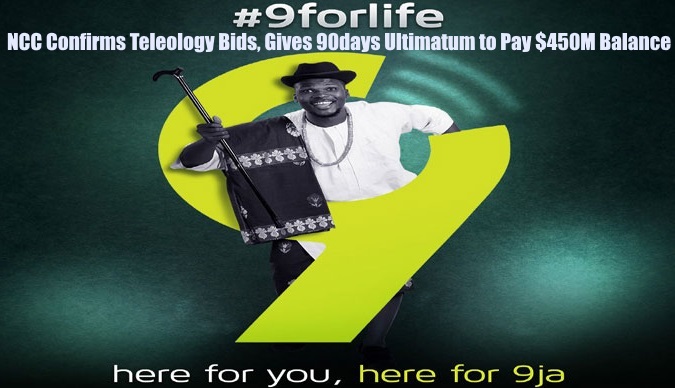 Since its emergence, it has maked efforts to take over the telecom, including the payment of the $50 million nonrefundable deposit and releasing its agenda for 9Mobile. Speaking on the issue, Prof. Garba Umar Danbatta, Executive Vice Chairman of the NCC said on Tuesday that 9Mobile will be handed over to Teleology after the payment of the balance is completed within the given period of time. Well, the gist I have for you is that the preferred bidder has emerged and it has been told to pay. Starting with a deposit of $50 million, which the preferred bidder has paid, we have information to this effect. What remains is for the preferred bidder to pay the balance of $450 million in the next 90 days, or less than 90 days, anyway. And upon payment of that amount, 9Mobile would be transferred to the preferred bidder, which is Teleology Holdings Limited.Danbatta said further: In the event that Teleology fails to make the payment at the expiration of the deadline, the reserved bidder will be considered, and the reserved bidder is Smile Communications.